Raft Building and racing provides a great opportunity to develop team work in a fun and competitive way. 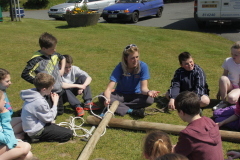 The group will be shown basic skills on how to build rafts and then under carefull supervision they will build their own raft and race it on the Lake. All raft building sessions take place on our sheltered lake at the Mooragh Park in Ramsey. Sessions are suitable for all ages and group sizes from 6 – 48 persons. Includes all safety equipment. What should I bring and wear for Raft Building? Old trainers or wet suit boots or beach shoes (these will probably get wet) etc. or T shirt to wear under wet suit.